I use Technorati. And I use Google. Each is good for different things. As a blogger, Technorati still gives me a better indicator of who is linking to me. Yes, I think that Technorati’s notion of “Authority” is nothing more than popularity. And in my business I know that profit is not the same as success (success is much bigger and broader than simply being profitable.) But, it’s still the best, most available indicator to me of whether my blog is having any influence, as measured by the people who think enough of my posts that they link to them. So, as a tribute to Technorati’s relevance, I offer this set of links to posts about David Sifry’s departure from Technorati – as recorded by Technorati at 8:26 PM on August 17. Jason Calacanis’ assessment from a person who has been there done that. Brian Oberkirch gets the last word. One of the highlights of this year’s Gnomedex was Darren Barefoot‘s presentation on using your online presence to do good. Darren pointed to several sites that enable individuals to sign up to make a personal contribution. For example, naburr links you to causes that could use your skill set, icouldbe matches mentors to teens, and geekcorps draws on the skills of internet technologists to help expand Internet use in emerging nations. Nothingbutnets is an online appeal for to help control the spread of malaria in Africa by sponsoring the purchase and distribution of mosquito nets. The site provides not only a means to make a personal contribution, but it also encourages donors to recruit teams of their friends and family to join them in extending the fundraising appeal. It features not only an onsite registration to create a team or sign up as a team member, but also offers a toolkits, posters and other paraphernalia that can be used by local organizers. Givemeaning is building a community of contributors who identify causes and needs from anywhere around the world and then organizes appeals to support tangible projects related to these projects. Darren`s message: Your impact can scale tremendously if you build “pyramid schemes for good.” Build infrastructure that helps others to do good. Don’t stop at making a personal contribution. Build something that encourages and assists others to contribute. I recorded a brief interview with Darren after the session. I think his message is inspiring. I hope you do too. The team of Web developers and designers I work with at 76design have got the social media bug. And they’ve been developing some neat applications and widgets to help people create, share and mash-up content. I’m enthused about what the 76designers are doing. And when they are ready to launch their apps, I want to play my part in telling the world about what the they have done. 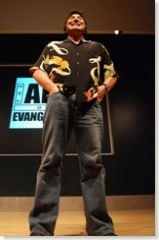 So, Guy Kawasaki‘s Gnomedex presentation about how to be a good evangelist spoke directly to me. 1. Evangelism starts with the desire to make meaning. The root of great companies is in making meaning, not just money. The people who start with a desire to make money often fail because they attract the wrong kind of co-founders and investors. 3. Roll the DICEE. We want to touch things that are golden. To identify this, look for something that is Deep (Reef sandal that includes a bottle opener on the bottom), Intelligent (Panasonic flashlight that takes multiple battery sizes), Complete (It’s not just the Lexus auto you buy, it’s the total experience of service), Elegant and Emotive (Harley Davidson). 4. Niche thyself. Strive to achieve both value to the customer and a unique quality to the product or service. 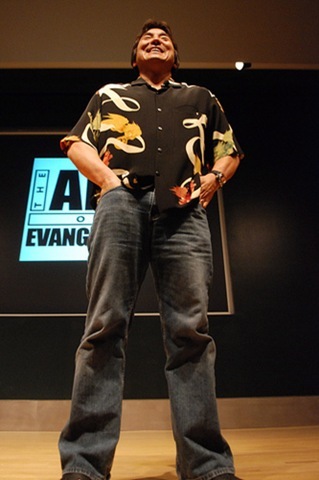 In other words, to be a successful evangelist, you need to be promoting something that offers real value. 5. Let a hundred flowers blossom. When you have a product or service, don’t assume you know who will use it and for what purpose. Be open to the unplanned. And follow those who are enthusiastic. 6. Make it personal. Relate directly to how the product or service affects the individual. How does it help you? 7. Find the true influencers. People who have imagination, can use a product and will have a passion for it. This is not likely to be in the C-suite. 8. Enable test drives. Give people a chance to try the product at no cost. Experience of a good product or service will sell that product or service. 9. Look for agnostics, not atheists. Never try to convert an atheist. It’s unlikely to happen. 10. Provide a slippery slope, an easy way for someone to say yes or to engage with you. 11. Don’t let the bozos grind you down. Believe. Be prepared to make mistakes. Keep going. After Guy’s presentation, one of the audience members asked him about his earlier admonition that, when developing software, you should “ship then test.” Guy underlined the need to get software out to the community as early as possible so that they can play with it. Everything will have its share of bugs. But users will quickly identify them and you can fix them as they do so. He wouldn’t recommend this approach for life sciences (! ), but it works great for software. Good advice from Guy Kawasaki that I know I will refer to again and again. 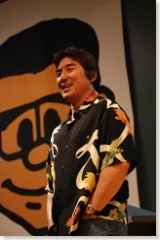 *Thanks to Josh Hallett for the Guy Kawasaki photos. For more great photos, check out Josh’s hyku photostream on Flickr. Adgoodness: Frederick Samuel showcases the best (and sometimes the worst) advertising the world has to offer. One Degree: A Canadian take on Internet marketing featuring the views of a stellar cast of Canadian marketing practitioners. Canuckflack: Long-time blogger Colin McKay draws from his eclectic interests to comment on all things online that interest him. And he shows just how interesting a sharp mind can be in the process. Twist Image: Mitch Joel, Canada’s “mini-Seth,” blogs, podcasts, speaks and in the process creates a one man promotion industry. His enthusiasm is infectious. Blogging Me Blogging You: Ed Lee knocks down the barriers between PR and digital media. Ed’s a transplanted Brit, but we’re happy to claim him as ours now. My Name is Kate: Online marketer Kate Trgovac has two blogs on the Power150: One Degree and her personal blog, My Name is Kate. She clearly knows something that the rest of us want to figure out. CrapHammer: Sean Howard has sent his blog into rapid ascent through edgy content and strong SEO. thefruitsofimagination: a blog written by the employees of Leo Burnett Toronto. And agency blog! Why aren’t more companies doing this? I have to confess that I was unfamiliar with some of these blogs. That’s one of the good things about lists like the Power150. Whether you agree with the rankings or the methodology or even the implicit competition (who can really deny being tickled to be on a list like this? ), these lists expose us not only to the well established, but also to new voices who are making a mark. I’d never come across Adgoodness, CrapHammer or thefruitsofimagination. But, as a result of discovering them on the list, I’ve subscribed to each. So the time I spent looking at the Power150 has yielded the return of discovery of three new blogs. That’s a pretty good ROI for a Sunday afternoon. Gnomedex – What happened to Joe's live blogging? If you’ve been reading my blog for a while, you’re probably wondering why I’m not live blogging Gnomedex the same way I’ve liveblogged previous conferences. Well, I’m trying something new. I’ve been carrying my video camera with me and grabbing interviews with some of the more interesting speakers and participants. So far, I’ve got video clips with Robert Scoble, Josh Hallett, Jeremy Wright, Darren Barefoot, and Chris Heuer. But if you’ve seem some of the videos I’ve already done, you know that I’m not yet very adept at production. And video production does take more time than writing. I will post about Gnomedex over the next several days as I edit and produce the clips. Just before I left Vancouver, I grabbed a quick interview with Tod Maffin. Tod spoke about the Vancouver social media scene and how Third Tuesday could fit in. It looks like the Third Tuesday Vancouver social media series of monthly events is a go. 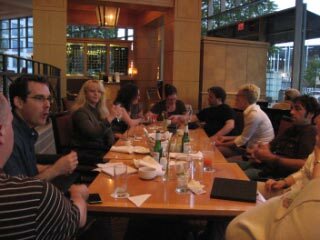 A dozen social media folks came out Monday evening to discuss bringing the events to Vancouver. At the end of the evening, new friendships had been made and the group agreed to launch the series. Just before leaving Vancouver, I grabbed a quick video interview with Tod Maffin talking about Third Tuesday in Vancouver. I’ll post that as soon as I’m able to upload the video. In the meantime, you can find out more by joining the Third Tuesday Facebook group or by joining the Third Tuesday Vancouver group on Meetup.com. Tod has also created a Google Group. Thanks to Tod Maffin, Tanya Davis, Jacqueline Voci, Kate Trgovac, John Biehler, Christine Rondeau, Steve Palmer, Michelle Sullivan (on loan from Montreal for the summer), Allyson McGrane, and Shane Birley for coming out for the session. It was great meeting you. The discussion showed again just how vigorous Vancouver’s social media community is. I’m looking forward to coming out for Third Tuesday Vancouver sessions whenever I can make it to the west coast. The Inside the CBC Blog reports on the introduction by Canada’s national broadcaster of two new policies governing use of social media by employees. “The CBC is directing its journalists to avoid adding sources or contacts as “Facebook friends,” and to not post their political leanings on their profile. But what is at stake with the CBC? Not lives. The embarrassment of senior management? In this case, it looks like the CBC wants to roll the clock back to an earlier era when managers believed they could control communications. (I emphasize “believed,” because communicators know that we’ve never really controlled anything.) It’s incredible to think that an organization that gathers news every day from countless sources – authorized and unauthorized – would believe that a policy like this will achieve anything other than to make them look foolish. How long will this policy stand before wiser heads retract it? Terry Fallis and David Jones have been nominated for a Podcast Award for their work on Inside PR. I get to see Terry every day. But the vast majority of Inside PR listeners have probably only heard his voice. So, I decided that Inside PR’s nomination would be a good reason to conduct a video interview with Terry. Terry talks about the history of Inside PR, its content and focus, some of the lessons he has learned from the experience (If you’re thinking of starting a podcast, this section is a must-watch) and the challenge of keeping it fresh after more than seventy weekly episodes. I didn’t have a chance to arrange for David to be in the room with Terry. But I’ll try to make it to his office at Fleishman Hillard in the near future to get his perspective. Oh, and if you’re a fan of Inside PR like I am, don’t forget to cast your vote for Inside PR. For the past year, Third Tuesday/Third Monday have provided the social media community in Toronto and Ottawa with a monthly opportunity to gather, hear from great speakers and talk about new developments in social media and social software. As we look forward to this autumn’s season, we’re hoping to start up a Third Tuesday in Vancouver. Vancouver has a great community of social media thought leaders and innovators. So, it’s a natural for us to try to extend the events to Vancouver. Several people, including Tod Maffin, Kate Trgovac, Tanya Davis, and Darren Barefoot (when he returns from his global jaunt) have said that they are willing to pitch in to make this happen. I’ll be in Vancouver next week on my way to Gnomedex. So, we’re organizing a get-together to kick off the planning for the fall season. 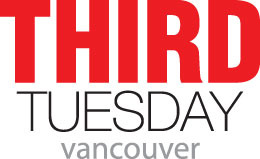 If you’d be willing to help with the organization of Third Tuesday Vancouver, we’d love to have you join us. Just leave a comment on this post or send an email to me and I’ll send you the coordinates of our get together as soon as we’ve finalized it. We’d also welcome your suggestions for topics and speakers. Please feel free to leave a comment or send an email with your ideas about what we should cover and who might speak to it.